This week, my students began a new writing unit ‘Realistic Fiction.’ It has been quite an interesting unit thus far as this genre requires them to have a really strong/more sophisticated vocabulary. They are writing in Spanish; therefore, at times they are scrambling to find the right words to describe their characters. 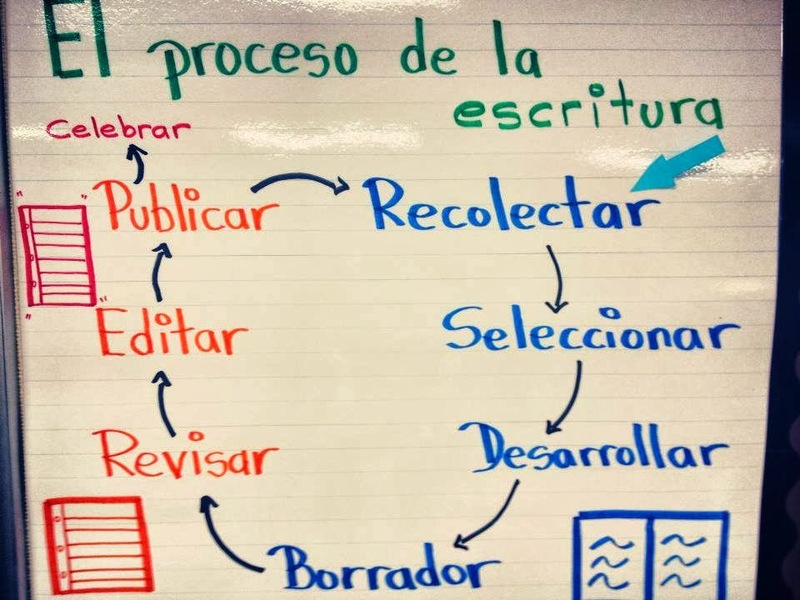 We began with an overview of the writing cycle – what each step entails. If you look closely at the picture below, you will see that recolectar, seleccionar, desarrollar y borrador are in blue. Everything in blue is done inside their writers’ journals. After that, the ink on the poster changes to orange which means that writers will be working on loose leaf paper. This includes revisar, editar, y publicar. In order to help students brainstorm and gather as many ideas as possible, I shared with them different strategies. They all tried each strategy a day, so here is our what our chart looked like at the end of the week. One thing for sure, I had to do constant checks to make sure my students stayed on topic. We are all working on REALISTIC fiction and not science fiction or fantasy, and for some students it may be a bit challenging to let their imagination run, yet with some parameters. Today we went over selecting a seed idea and started to think deeply about the characters in our stories – especially the main character (protagonist). Students had the opportunity to work with a partner and think about character traits (or rasgos de carácter). At the end, their exit ticket was a sticky note with the name of their character, age and two things that would describe them (I will go over in detail next week about internal and external features, but left it a bit simple the first time). Me gustó mucho la idea del cartelón en donde cada estudiante pone un post-it con la descripción de su personaje. Gracias por compartir.